Drones aren’t some sort of expensive far-fetched technology anymore. These super popular toys are surprisingly affordable and a whole lot of fun for everyone of all ages. (We are looking at you too mom and dad!) And while there are plenty of drones out there that are beginner friendly, but unfortunately, many are not suitable for kids. However, there are some that are. Choosing a drone that is easy to learn to fly is crucial. Kids can get discouraged easily if the flying the drone is too complicated and crashes constantly. (Or even worse: doesn’t even move from taking off!) That’s why we came up with this list. And our three main criteria? Easy to use, affordable, and durable. But before we jump into the list, here’s the lowdown on drones and what you need to know about flying them outside, safety precautions and more. Drones, also known as UAV or Unmanned Aerial Vehicles were originally made for the military, but the ones you see today are smaller, relatively easy to use and of course, do not have any weapons attached to them. However, many drones do feature cameras that will either record video or take photos that are stored on a memory card or stream video or photos to your smartphone or tablet! And while they are on many kids’ wish lists, drones don’t come without their own controversy. We’ll get into safety and laws shortly, but as long as kids follow the safety guidelines and local rules and regulation in regards to UAVs, then you and your child will have no problem. There are a few things new drone fliers should keep in mind in order to have a safe flying session. Patience is key. While drones are pretty easy to use, it does take some practice. Kids should be patient when it comes to learning and operating a drone. Keep the drone within range. Check the manufacturer’s information to see what the range, or how far the drone can fly out to before the controller loses a signal. Check the weather. A windy day could mean trouble for your child’s drone. When it comes to temperature, drones do better in cooler weather. Hot weather will drain the battery faster whereas the battery will last longer on a cooler day. Know the battery life. Keep an eye on the time. A drone that’s far off with little battery could make for an interesting search and rescue. Some drones have a low battery warning, but many do not. 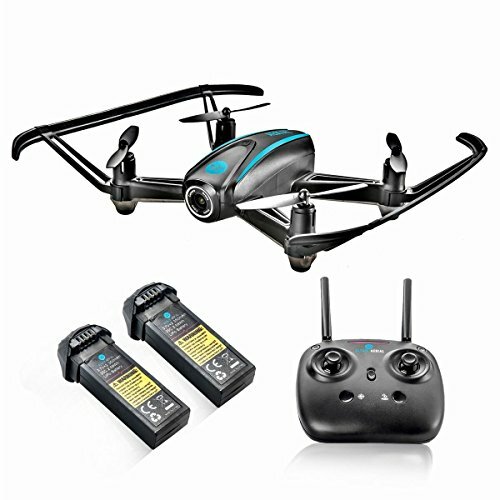 Keep the drone relatively close the first couple of times to see how long flight time is with a fully charged battery. Stick with a smaller drone first. Smaller, toy drones are cheaper and in the event there’s a major crash, there won’t be any tears. Once kids have learned on something durable, small and compact, then check out one of the larger, faster models. Make sure the drone is suitable for your child’s age. Something that is safe for a 5-year-old might bore an older child. And something that is suitable for a teen may be a disaster if operated by a 7-year-old. There’s a reason for those age requirements. Flying a drone safely is extremely important not only for safety reason but for legal reasons as well. Here are some safety guidelines you and your child should follow when operating a drone. Never fly a drone over a crowd of people. You should be able to see your drone at all times. Keep it in your line of sight. Never fly a drone near another aircraft or near an emergency response vehicle. Never fly a drone in a space that specifically prohibits drones. Do not fly a drone above 400 feet. Also, be sure to check with the instruction booklet that is included with the drone to see if there are any additional safety guidelines. And before your drone takes flight, check with your local and state laws about drones first. For most places in the United States, any unmanned aircraft system (UAS) that weighs over .55 pounds must be registered with the Federal Aviation Administration, also known as the FAA. Also, in order to register a UAS, you must be at least 13 years old. Just because a drone states it’s good for beginners, doesn’t necessarily mean it’s good for kids. So this list concentrates only on drones that are kid-user-friendly as well as safe for kids. While most of the drones on this list won’t cost you more than $100, drones with cameras tend to be more expensive than those without, so keep that in mind when choosing one for your child. Left, right, front, back, it doesn’t matter which direction this drone goes, as it has a headless design. 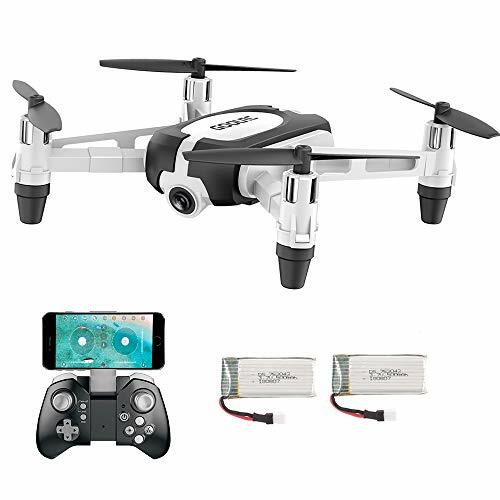 The DROCON mini has what they call 3D Action Flips which means with just a push of a button, kids can flip this drone backward, forwards or left to right and vice versa. Keeping it under 400 feet will be no problem with the DROCON mini. This drone features an altitude hold mode so the user can set a height limit. And the one key take-off and landing features make it easy and safe for kids to get it going and land the drone safely. The DROCON Mini has three speeds – low, medium and high. It can be charged via a USB cord via a computer or charged right from the controller. This set comes with everything kids need to get flying including spare propellers, all for a very affordable price tag. The DROCON Mini gives kids about 5-7 minutes of flying time. Headless style. No need to face the drone to go in a direction. 3D Action Flips from any direction. Altitude lock mode to keep drone form going over a certain height. One key take off and landing makes it easy to get going and landing. Easy to carry around and use. Not great at flying in any type of wind. Works better indoors. The 818 Plus Hornet is definitely pricier but it gives kids a whole 15 minutes of flying time per battery (and it even comes with 2 batteries). And it also comes with an HD camera to film the flying adventure. It has an impressive long range of 150 meters, so kids can go further for longer. The HD camera connects with most tablets and smartphones and provides a 120-degree first person view in real time. The 818 plus Hornet also has altitude hold too, to prevent kids from going to high, making it suitable for beginners. And besides the one touch take off and landing feature it also has an emergency landing feature too, in case your child loses control. Luckily, the propeller guards make getting stuck in trees a little less likely and the LED lights make it easier to see in the dark. HD Camera provides a 120-degree view in real time on phone or tablet. Emergency landing feature and propeller guards provide additional safety. Long flying time and range. 3 controller skill settings to make flying easier for beginners. Altitude hold prevents drone from going to high. Easy to lose control of drone even in light wind. 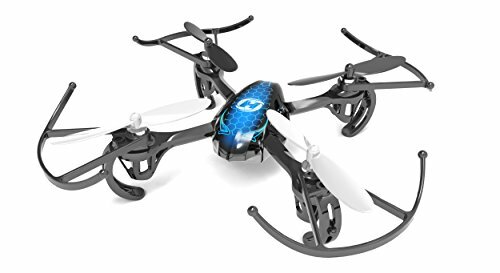 Like the DROCON drone, this is a headless-style drone that has a 6-8 minute flying time, but this one is better in the wind and even features LED lights for a fun nighttime flying experience. 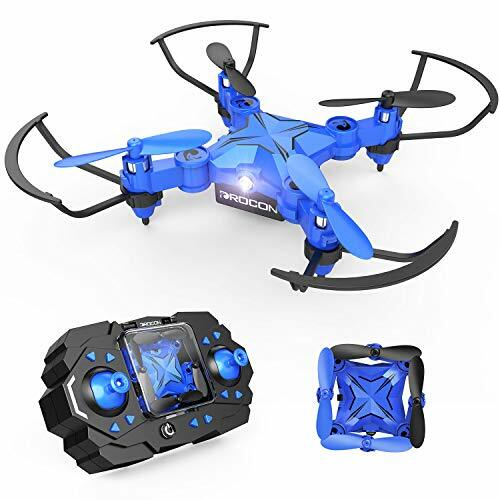 The Holy Stone Predatory Mini features 6-Axis Gyro Technology which simply means that with a push of a button kids can flip this drone in any directions for an exciting show. The hook-like propellers though have a tendency to hook on to branches, wires, and obstacles easily, so be careful to keep this drone away from them! This drone is best for older kids. It’s a speedy little thing that takes a little longer to get used to then the DROCON drone but is still easy to learn and control. 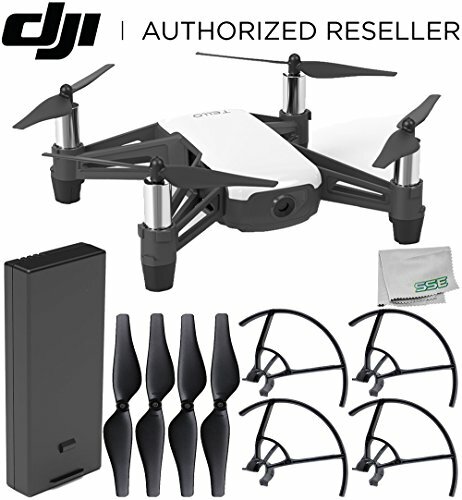 This set also comes with 4 additional blades, but the drone is durable enough to take a few crashes without getting damaged. Low Interference technology keeps the drone connected to the controller within 30-50 meters. LED lights are great for night time use. Headless flight system for easy navigating. Hook-like blades make it easy for the drone to get tangled in wires, branches, etc. The UDI 818A has an HD camera with a 1280 x 720 resolution is great for taking pictures or video in flight. It also comes with 2 batteries, each with a flight time of 6-8 minutes. But don’t worry, it also has a low battery warning too. With just a push of a button, the drone has a return home function to make getting the drone back easy. It’s also headless and features a 6 Axis Gyro Stabilization for some fun 360-degree flips. 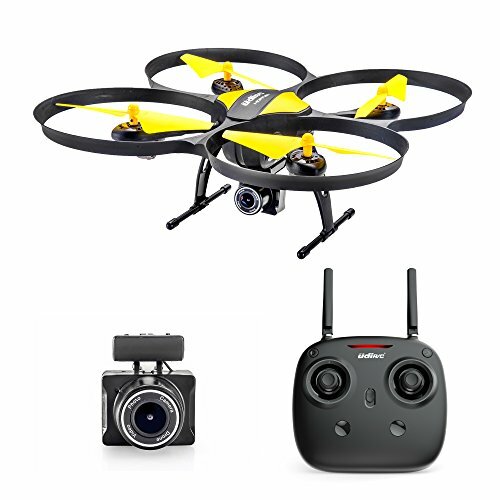 With three speed modes, low, medium and high, this drone is great for beginners but is also great for kids with some drone-flying experience too. LED Lights for night flying. Not as durable as other drones on this list. 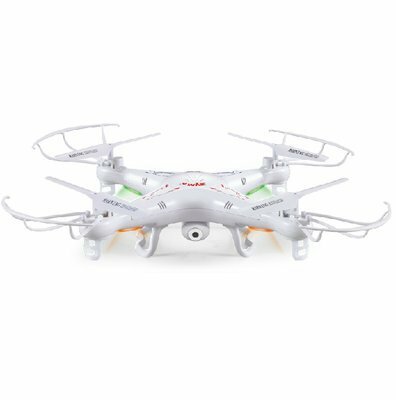 The Syma X5C-1 is a unique looking drone that has a built-in HD camera to take pictures or video right from the controller. It also features the 6 Axis Technology for flips and tricks while it stores the pictures and video from the flight on the micro SD card in the drone. The semi-circle guards around the propeller make the drone able to handle some wear and tear a little better as well as protect the propellers from getting caught in any obstacles. It has 7 minutes of flying time and takes about 100 minutes to charge. For nighttime flying, simply turn on the LED lights for better visibility. This drone is easy to use, but you may want to buy an extra battery. Seven minutes goes by fast! Affordable, especially since it includes a camera. 6 Axis Technology for flips and maneuvering. Can handle some crashes without breaking. Need to purchase additional batteries to swap out batteries for extra flying time. For the most bang for your buck, the Ryze Tello is it. This drone has a long flight time of 13 minutes from one fully charged battery. It also has an Intelli Processor so you can program it on your smartphone to do flips and tricks. The HD can take 720p video and 5 megapixel photos that can be sent straight to your smartphone. All you need to do is download the easy to use Tello app. To make things even more fun, hook up your smartphone to a virtual reality headset and use the controller for the ultimate first-person flying experience. The starter bundle comes with the drone, controller, propeller guards, extra propellers, battery and cleaning cloth. Tello app is easy to use. Can be used with a virtual reality headset. Stream video and photos right to your phone. Tricky to pair the drone to your smartphone and controller. The FITMAKER is a fun little drone that is super affordable and fun to use indoors and out. The super bright and colorful LED light around that line the propeller guards will entertain family and friends. This drone comes with only two speed options, high and low, and can perform 360-degree flips with ease. The one key take off and landing makes it easy for beginners to use too. The range is only about 165 feet, but the flight time is about 8-10 minutes. The FITMAKER is a good choice for younger kids because it’s easy to use and control. Bright LED lights are fun. Up to 10 minutes of flight time. Perfect for younger kids. Easy to use. For the price, it’s hard to beat the aerial shots this powerful little drone can take. The 720p camera transmits straight to your smartphone for first-person point of view viewing. The 6 axis gyroscope technology means this will flip and move in every direction 360 degrees. But the features don’t stop there. It’s got one key return, emergency stop, a hover function, altitude hold and more. For an autopilot function, download the app and then draw the flight route you want the drone to go. 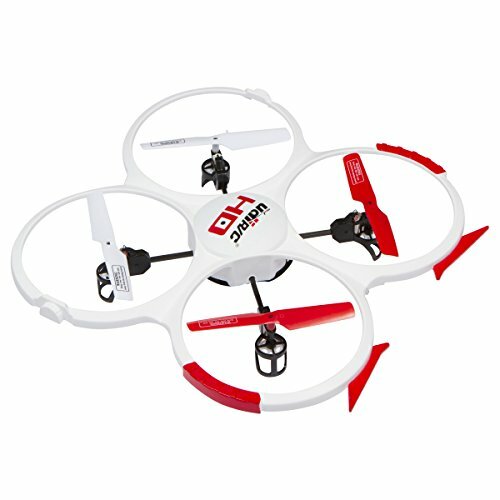 It has about 165 feet range and only a 6 minute flight time though, but it is good for indoor and outdoor use. Hoover function and altitude hold. One key take off and return feature make it easy to use. The app allows you to program autopilot path. Transmits FPV video and photos to the phone. 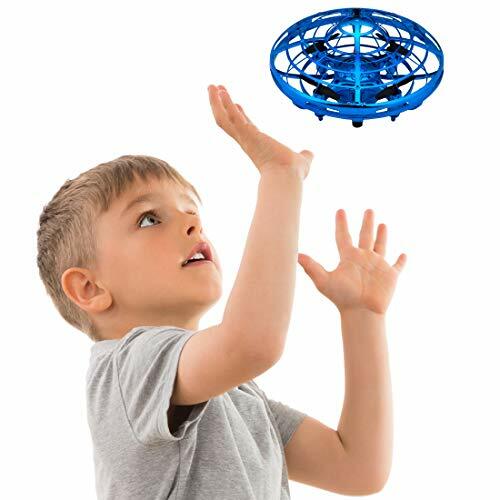 For kids as young as four years old, this easy to use drone has no tricky controllers or apps. Kids control it by using their hands. A full battery will get you 8 minutes of flying time. The drone senses kids hands as well as other obstacles by the 3 sensors located on it. The durable outer shell also means that it can handle a few bumps and falls. 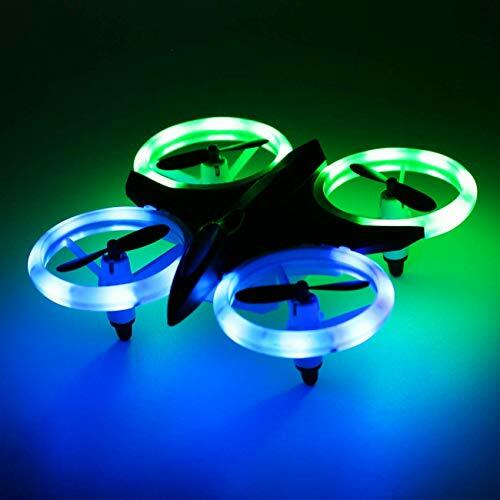 It comes in three colors: red, blue and silver, and has LED lights for some cool nighttime flying. It is so fun and easy to use you might even want to play with it too! No remote controller. Use hands to control drone. For kids as young as 4 years old. Comes in 3 color choices. This camera-ready drone is great for indoor use and can get 120-degree wide photo or video that streams straight to a smartphone. It also has a good flight time, up to 10 minutes, and has a range of about 100 meters. While a smartphone isn’t required to take picture or photos, it allows you to view the video in real time. Also, from the smartphone, you can draw a route with your finger which the drone will follow. The Altair AA108 is a headless drone for easier navigation and has a one-touch take off and land function as well as an altitude hold. Custom flight route on the app. Real-time first person viewing from smartphone. Choppy camera footage during viewing. Q: Can’t my child break a drone easily? A: The drones on this list are able to take a crash or two without breaking apart. Some even come with extra propellers for just in case. However, the best way your child can prevent from breaking their drone quickly is to follow the tips we suggest in the Drone 101 section as well as the Drone Safety and Laws section. Q: How old does my child need to be to operate a drone? A: It depends on the drone. Check to see the age recommendation is for each drone. But in general, kids between 8-10 can start using a drone, with many suitable for pre-teens to teens. However, we did include a drone that is safe for kids as young as four years old to use! You don’t need to break the bank in order to buy a drone. For our top pick, we highly suggest the DROCON Mini RC Drone. This budget-friendly drone is durable and easy to learn how to use, making it perfect for most kids. However, if you don’t mind spending a little extra for longer flight time and camera-capabilities, definitely check out the Altair 818 Hornet. Kids can watch the video in real time as their drone zooms around.